PushON has been banging the drum for omnichannel marketing for some time now. In short, it’s all about keeping the customer experience consistent, predictable and focused to ensure they remain customers and don’t have their heads turned by other offerings as they scour the high street and the internet for good deals. But while the case for omnichannel has always seemed instinctively sound, businesses need more to go on if they’re to invest fully into the philosophy. PushON has conducted a study to look at customers’ attitudes towards omnichannel, which you can browse or download here. 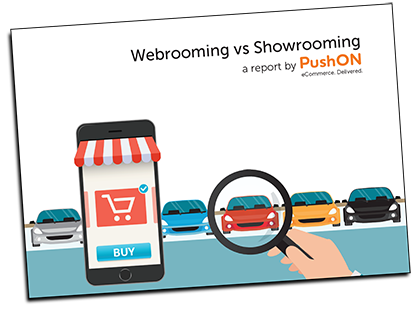 The report,”Webrooming vs Showrooming”, looks at two important shopping habits that are having an impact on all retailers, be they solely online, just physical or trading on both avenues. The two habits of the title can often be viewed by retailers as threats, but if you’re a smart retailer, we’ll show you how they can be used to your advantage. Not sure what they mean? Showrooming is checking out products in-store, where you can try them out, wear them, smell them and test them – but making the actual purchase online, benefiting from better prices, not having to transport the goods and choosing delivery options. Webrooming is the opposite: doing your research online, then visiting a store to make the purchase. The threat from showrooming is the more obvious to retailer – business premises, stock storage, logistics and staff all cost money, but if people aren’t buying, the revenue is going elsewhere. But webrooming isn’t victimless either. It takes advantage of hosting and bandwidth investment and the costs of paid and organic marketing to get users to your site. If they don’t convert into customers, it’s expenditure without return. The report looks at the kinds of attitudes people have towards their own research, validation, decision-making and purchasing journeys, and it exposes holes in the way many ecommerce businesses conduct themselves. For example customers are much more likely to shop face-to-face when they’re making a big purchase, with almost two fifths having a mental limit of £1000 on a single online purchase. Retailers of such goods (think cars, home improvements, package holidays) need to win over webroomers and entice them into their stores. Another key finding concerns the use of technology such as augmented and virtual reality (AR and VR). By immersing customers into a 3D world where they can “look around” products, they are straddling the realms of showrooming and webrooming – getting a feel for the product in situ without leaving home. The report looks at how this phenomenon can convert showroomers into customers. And we’re not talking about speculation here – IKEA has already started trials of AR technologies to let customers visualise how furniture would look in their own homes, which is arguably better than the guesswork that you’d be performing in the labyrinthine store. You would probably imagine that as online developers and marketers, PushON would be happy to witness the demise of the brick and mortar shop. But the evidence points to a much more varied and exciting future for retail, where the online and the offline work in harmony to deliver the ultimate customer experience where the whole is bigger than the sum of the parts. Have a look at the report to get a feel for customers’ mindsets and how you, as a retailer, can benefit from them.